Finally, I've got the ball rolling on wedding planning and I'm excited to share the journey with you! Wednesdays here at The Electric Typewriter will be dedicated to all things wedding. From the nitty-gritty of planning a budget to the fun of making decorations, you'll find it here. Leading up to the big day (10-11-12), there will be plenty of tutorials, tips and hopefully some awesome tricks! Now that I've got the dress picked out (I'll have to wait to show you that! ), it's time to pick out bridesmaid dresses. With so many choices and colors out there, visions of Katherine Heigl in 27 Dresses keep floating though my head. Or how about the scene in Bridesmaids where the bride's friend wants them to get the most expensive (and ugly!) dress? It turns out choosing a bridesmaid dress was a bigger deal than I thought! My current inspiration for dresses: A multi-colored palette, with dress shapes to fit every girl. Not break the bank. The perfect dress should be reasonably priced. I'm a firm believer that high price does not always equal high fashion. Be unique, but classic. If it is not something I'd hang in my closet, then it is out of the question. Compliments the woman who wears it. It should be something she wants to wear again and again! 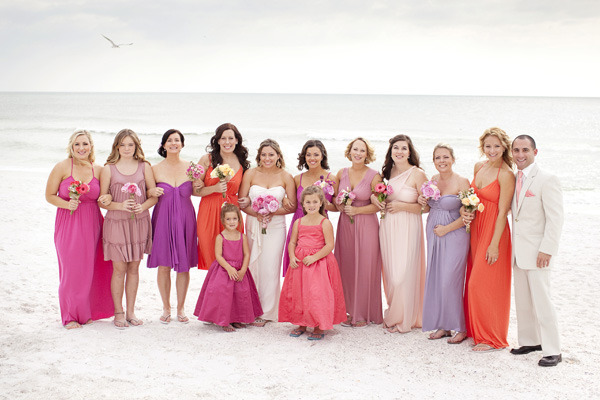 Have you been a bridesmaid before? If so, have you worn your dress again?